Johnny Gaddaar is a cleverly inspired version of the 1970 Dev Anand [Images] vehicle, Johny Mera Naam. Whether the original needed remixing is debatable, director Sriram Raghavan puts the prominence in Johnny Gaddaar on entertainment and not entirely on inventiveness. That is, the film generously borrows from countless other similar films, adds little, and yet somehow holds your attention. The title, Johnny Gaddaar, refers to an almost obligatory in such films, a fake name that forms the basis of this eye-popping heist. This one takes place on a train. Sheshadri (Dharmendra [Images]) is a charming gentleman living out his days by listening to his deceased wife's voice on a tape recorder. But few know that this sweet and simple guy is also a mastermind criminal. 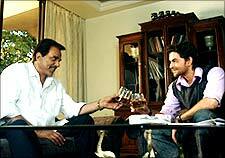 His crew consists of a club owner, Shardul (an effective Zakir Hussain), a game parlour owner Prakash (the ever dependable Vinay Pathak), a wrestler Shiva (Daya Shetty) and a stock speculator Vikram (Neil Mukesh). We are quickly led into the lives of the crew and before you know it, they have an assignment where they stand a chance of making Rs 2.5 crores in just four days, with an equal share of Rs 50 lakhs each. But as is always the structure of a heist film, there is a double cross, and someone in the team gets killed. Johnny Gaddaar assumes that we're a thinking, breathing audience and not just popcorn-munching machines, as it holds the audience's hand and leads them through intricate planning, and a lot of twists and turns. Writer-director Sriram Raghavan cues us in on certain details, but keeps most of niceties private. This way, we're always kept on the edge of our seats. We think we know what's going on, but by the time we find out that we're wrong, we've been introduced to a whole new bag of tricks. Johnny Gaddaar is clever, in a rather implausible sort of way. This unevenly constructed picture is still entertaining and never boring. However, the second half slows down. Like Ek Haseena Thi -- Raghavan's first film -- this is also a dark film (with some redundant violence) that suffers pacing issues in the second half, partly due to faulty writing. Also, many logical questions are thrown up in the air. Even as bodies are popping left, right and centre, the police is almost never involved. Further, the affair between Neil Mukesh and Rimi Sen [Images] looks unbelievable, considering her otherwise incredibly street smart husband, Zakir Hussain. The performances are top notch in all departments but Dharmendra could have been given a fewer English lines. He says 'Stupid, idiot,' in the famed monotonous 'Kutte, Kamine' mode. Not happening Dharampaaji. 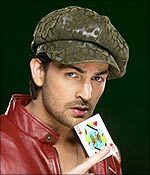 Debutant Neil Mukesh is exciting. Wisely, he doesn't attempt to mimic any of his generation but instead, uses his brand of understated charisma to get us to like him. To be honest, Johnny Gaddaar isn't exactly what you could call a 'great' movie. It's overwritten and over directed for most parts. Yet, against the odds, it works in its own quirky way.